Our flagship cheese. 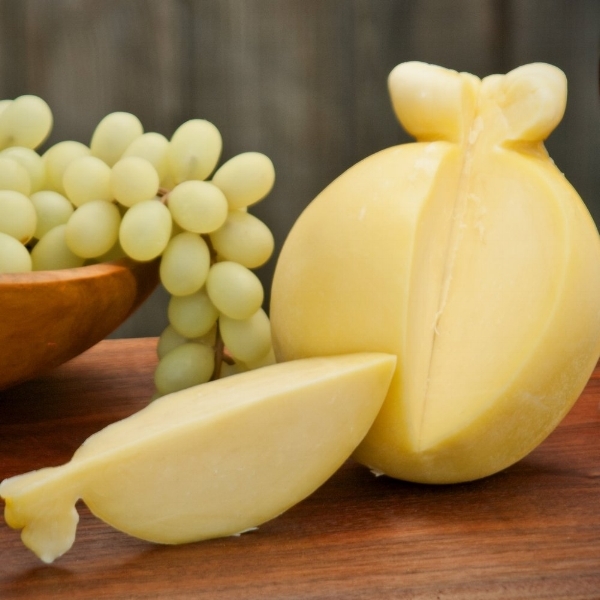 We have been selling this cheese for decades here at Lovera's. Rich and buttery, Caciocavera is a cross between smooth mozzarella and the earthy depth of provolone. This table cheese is also wonderful melted on your favorite sandwich, pasta dish, and homemade pizza. Our smoked Caciocavera won 1st price in Sacramento in 2014 for top smoked cheese in the USA. Balanced...Caciocavera's buttery notes with a savory smoked finish of locally harvested Mockernut Hickory. The smooth, rich texture and flavor of this handcrafted cheese is only enhanced when melted on your favorite sandwich, burger, or even macaroni and cheese. This hand-shaped devil of a cheese is loaded with a blend of crushed red pepper, cayenne, and ghost pepper powder. After brining, these cheeses are carefully powdered with cayenne and paprika for a stunningly red hot rind. A legend in the making; Diavolo brings the heat! A sweet heat that finishes slightly buttery as the base of the traditional caciocavera comes through.